Part of protest in Mexico City against the killing of three photojournalists. Mexico is becoming an increasingly dangerous place to be a journalist. 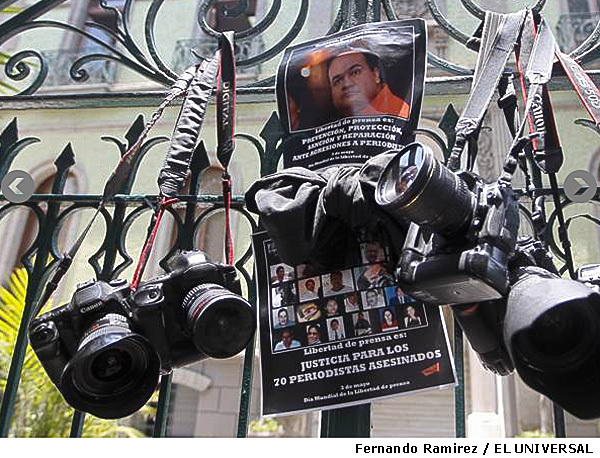 Three photojournalists were found dead and dismembered Tuesday in the Gulf state of Veracruz, bringing to 44 the number of journalists killed in Mexico in the last six years, according to Article 19, a press freedom group. While that number pales next to the more than 50,000 Mexicans killed in the same period during the government’s war against the narco cartels (and cross-cartel fighting), it elevates Mexico to No. 8 on the Committee to Protect Journalists’ 2012 Impunity Index, “which spotlights countries where journalists are slain and their killers go free.” Sadly, the year is still young. I have a long history with Mexico, including being the owner of a house I built there, but with many Mexicans clamoring for an end to the violence, the repressive PRI party on the verge of regaining the control of the presidency that it held for more than 70 years; the cartels becoming increasingly entrenched in local and national politics, and a the country’s always ethically tenuous journalistic institutions fighting — quite literally — for their lives, I fear the worst for the country in the near term. Mexican journalists take the smallest hint of a threat seriously because they know that killing a reporter is so easy to get away with. The word for this is impunity–killing with no consequences. None for the killer, at least. But the consequences for the Mexican people are that journalists are afraid to report the news. This entry was posted in Journalism, Mexico, Photojournalism and tagged Article 19, Committee to Protect Journalists, CPJ, Jorge Medellin, Journalism, Mexico, Photojournalism, Regina Martinez Perez.